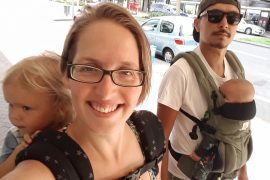 I was pretty excited when I was asked to do a review on the Ergobaby 360 Carrier. Ergobaby is quite a well-known brand in the babywearing world and has been around for a long time. The Ergo 360 is a revolutionary designed carrier that gives ergonomic support and comfort for baby and you in four positions: front, back, hip and forward facing. It has been acknowledged as a “hip healthy” product by the International Hip Dysplasia Institute. The Ergo 360 is recommended for babies from 3.5kg to 15kg, or from birth to around 36 months of age (Instructions recommend using the infant insert for babies weighing between 3.5kg to 5.5kg). Most babies, depending on size and head control, will fit into the 360 between 3 and 4 months of age without the extra insert required. In order to get a really good overview of the Ergo 360, I decided to invite a couple of mums around for morning tea and a carrier “play date”. What fun we had trying it on with different size body shapes and different aged babies: a newborn (with an insert), a 5 month old, a 7 month old and a 16 month old. Everyone found something they liked about this carrier. The unique design of the Ergo 360 allows baby to sit comfortably with their weight resting on their bottom and their knees at the same level as their hips in all positions, unlike other carriers that allow outward facing. The structured bucket seat of the 360 has more depth than other carriers and allows baby to be in a more seated position. The first thing I noticed was that I had been sent the Ergo 360 Cool Air Mesh. Unlike the Standard Ergo 360, it does not have the wide velcro waist band. A lovely improvement I think, you don’t have to untie the band to adjust the fit and no more waking baby as you take the carrier off. Instead, it has a buckle to fasten and has a padded lumbar support cushion that is adjustable on both sides to keep it centred. The other main difference is that is has mesh panels, which as the name suggests, keeps you cooler by allowing the air to flow through. (I imagine velcro and mesh wouldn’t have gone well together either when washing). The straps are well-padded, shaped, rucksack-style straps that distribute the weight evenly on your shoulders. They cannot be crossed at the back but rather are secured by the easily moveable chest clip (or back clip when used in the front position). The buckles are a little stiff to tighten – I did need a bit of help in a back carry to tighten it “just that little bit more”, but I am sure will move more easily with more use. The only thing I feel they are missing is the front PFAs (Perfect Fit Adjusters) which allow the wearer to tighten the space between the straps and the panel. Some wearers also like PFAs for their ability to quickly lower a child to breast height to nurse: the lack of PFAs will not stop you from breastfeeding in the Ergo 360. The panel of the Ergo 360 is easy to adjust. There are two pairs of buttons on either side of the panel which adjust the bucket seat to a narrower setting used for babies in the outward-facing position. The top half of the panel is narrower than the bucket seat and there is an extendable back panel that can be rolled down for outward-facing, or upwards to provide head and neck support for a small baby, or to extend the length of the panel for a toddler. The bucket seat design will ensure that your toddler is still sitting the correct ergonomic position (M shape), even though it may not go from “knee to knee”, bigger toddlers or pre-schoolers may begin to find it uncomfortable over extended periods of time. It has a smallish hood attached to support the head whilst baby is sleeping or for a bit of sun protection. I would suggest only doing up one side, so that you can always see baby’s face. 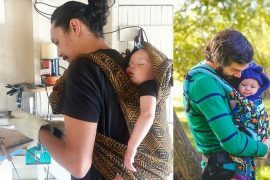 I think the big draw for this carrier is the forward-facing option to carry babies 5-6 months onwards, when baby has adequate neck, head and body strength and is close to sitting on their own, while still offering the same comfort and support as in its other positions. Ergobaby recommend that this position be used only for short periods and only when the child is awake. In their instructional video they suggest 10 minutes. Parents should watch out for signs of overstimulation, which can differ from child to child. So when your child is fussy, tired or “zoned out” it’s time to turn them back to facing you. 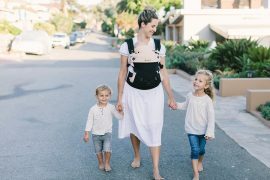 I really like this carrier and think it is a great option for parents who are intent on forward-facing their babies as it provides the best support, comfort and positioning for them. Just keeping in mind that it is to be used in that position for short periods of time to avoid overstimulation. A separate bib can be purchased and attached for those dribbling, teething babies. I also like the wide waist with lumbar support panel which distributes the weight evenly on my hips. It provides good support for carrying forward-facing when my centre of gravity is thrown off a bit. Not to mention no more “muffin top” or trying to get inventive with my clothes to hide it. I feel you will get quite a bit of use out of this carrier with the extended panel offering good support for older toddlers, the bucket seat still keeping them in the recommended “M” shape or squat straddle position even when the panel does not go from knee to knee anymore. 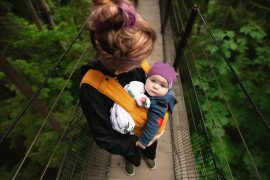 The Ergobaby 360 Carrier really is a simple, versatile carrier that is easy to use from birth to toddler. It is also machine washable which makes it very easy to care for. The Cool Air Mesh option is perfect for our hot summers, as the lining has moisture wicking properties to keep you cool and comfortable. Ergobaby also have very good instruction videos available and I really recommend watching their videos to help you get an ideal fit for you and your baby. Shelley du Plessis is an Approved Babywearing Consultant by The Babywearing School Australia. You can find her on Facebook at Up-a-Bubba. 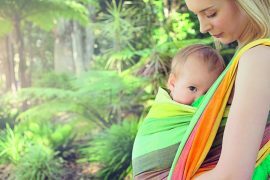 It’s Babywearing Week: Here’s How You Could WIN an Ergobaby Carrier! 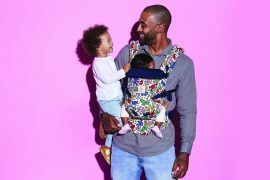 Are Baby Carriers Worth the Money? 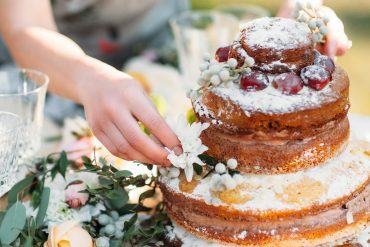 Kick Cravings for Carbs. Simply!